Calvin agrees to sell them planet Earth in exchange for a collection of 50 leaves from their home planet, to be delivered by that evening. The aliens immediately jump on this deal and head back to their planet. When Hobbes points out Calvin’s extreme short-sightedness in sacrificing the entire planet just so he can turn in a school assignment, Calvin comments that grownups haven’t exactly done a great job running Earth either. As night comes and the aliens still haven’t returned, Calvin grows anxious and delivers a long rant against individuals who procrastinate and don’t turn their work in on time (Hobbes is quick to pick up on the irony). Eventually the aliens come back and give Calvin the leaf collection, though he gets in trouble with his parents for being outside at such a late hour. The next day Calvin turns in the project but gets a bad grade, as his collection appears to consist of only 50 maple leaves cut into funny shapes. Two months later, it’s Christmastime. 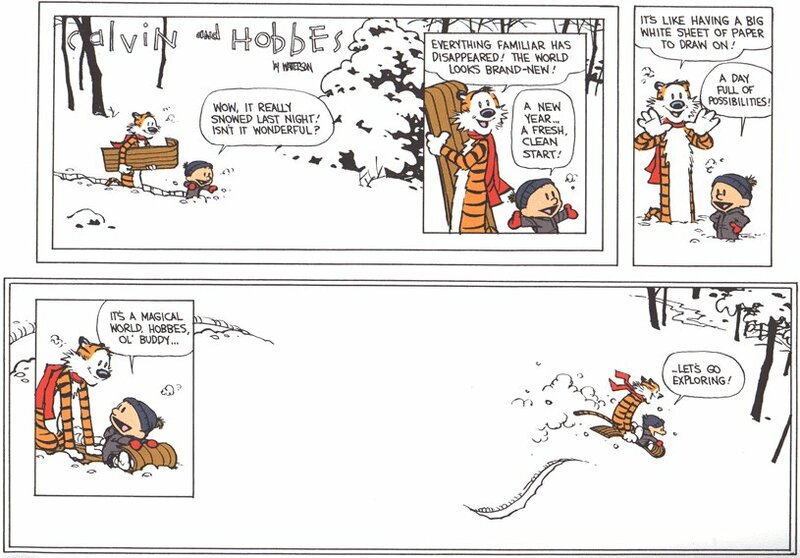 On an especially snowy day, Calvin answers the front door to discover Galxoid and Nebular, freezing from the snow, complaining about the “faulty planet” that Calvin has sold them. Calvin explains that the Earth has an axial tilt, causing it to snow every winter. Upset that they were not informed of this defect, the aliens demand a refund, but Calvin reveals he threw away the leaf collection after getting a bad grade. Suddenly Calvin’s mom walks over and Calvin quickly covers for the aliens, saying they are girl scouts, but had to go earn a merit badge. After hearing about the matter, Hobbes proposes they compromise by finding a way to at least help the aliens keep warm. Since they are tiny, armless creatures, Hobbes is able to clothe them with his and Calvin’s Christmas stockings, much to Galaxoid and Nebular’s approval. The matter is now resolved, but Calvin is upset at having to sacrifice his stocking, fearing that now Santa Claus won’t have a place to leave him any loot. When Hobbes points out that Santa will be proud of them for what they’ve done, Calvin grows excited and greedily fantasizes about being spoiled with endless gifts and trips to the North Pole. As usual, Calvin has learned nothing. First off, it must be mentioned that Galaxoid and Nebular are two great characters. They are benign, chatty, and naive, blindly believing Calvin is the Earth’s ruler just because he says so and accepting his bizarre price of 50 leaves without any questions. 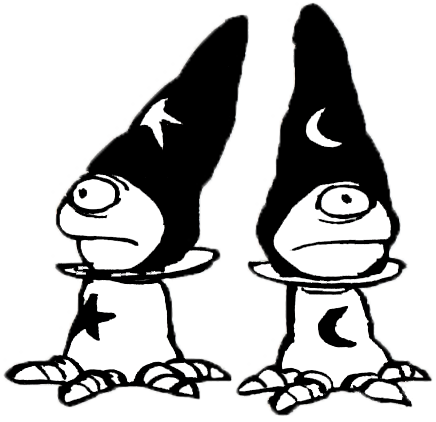 Despite their goal to take over the Earth and even declaring war on Calvin, they never come off as any serious threat and I get the impression that, had the strip continued, they might have come back for further storylines. As the final CALVIN AND HOBBES story ever, both of our lead characters are in top form here. Calvin is so lazy that not only does he refuse to start his assignment until the night before it’s due, but when he finds himself in an unexpected situation where the entire fate of the planet lies in the balance, he exploits it to his advantage. Calvin would rather have Earth conquered by aliens than do his own homework. Furthermore, shortly after turning the project in, he forgets the whole thing even happened. Had the events of Part 2 never happened, Calvin would likely have never given a second thought to the aliens he sold his planet to. Hobbes, as usual, is the voice of reason, and once again saves the day at the end. Only in the world of Bill Watterson could a potential intergalactic war be stopped over a pair of Christmas stockings, and only Calvin could be so greedy as to value his Christmas loot over the fate of the planet. 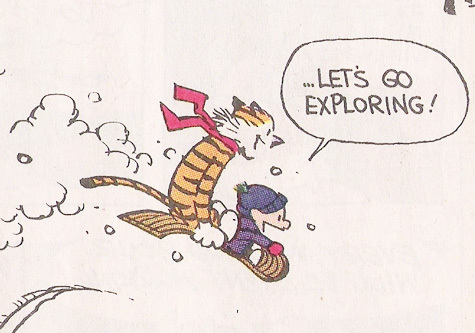 In the end, this is definitely not one of the greatest CALVIN AND HOBBES stories of all time. It’s imaginative, but nowhere near the level of “Weirdos From Another Planet” or “Attack of the Deranged Mutant Killer Monster Snow Goons” or what is probably the CITIZEN KANE of the strip: “Scientific Progress Goes Boink!” Yet, when one considers it as a work of finality, it takes on a much heavier tone. Calvin’s selfishness has grown to the point where he is the Earth’s leader, at least in his own mind, and Watterson’s serendipitous writing has reached the point where leaf collections, aliens, Christmas stockings can save the day. The entire story has a HITCHHIKER’S GUIDE TO THE GALAXY vibe. 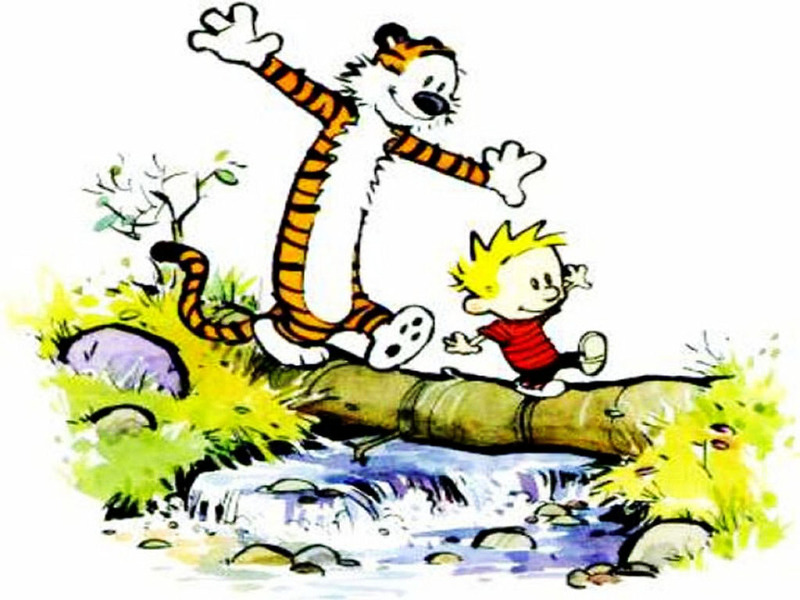 Like all great works of art, CALVIN AND HOBBES went out on a high note!